Dr. Buckland obtained his Bachelor’s degree in engineering from Cambridge University. After a decade of practice in his chosen profession, he returned to Cambridge for a Master’s degree and an Honorary Doctorate from the University of British Columbia. Dr. Buckland is an engineer of renown in bridge design and construction, although he is known for his work with other steel structures in both the civil and mining fields. He is of course Peter Buckland, of Buckland and Taylor - - Canada’s best and internationally known company specializing in the design and construction of bridges. He co-founded this company. His career began with the famous bridge designers, Freeman Fox and Company of the IK. Following an initial decade of practice there he came to Vancouver and established his own company. There he not only developed this company, but has been involved in the design, construction and renovation of more than 100 bridges, large and small. Many of these are very well known, for example the Confederation bridge in PEI; the Lions’ Gate bridge of Vancouver, the Golden Gate suspension bridge of San Francisco; and the Alex Fraser cable-stayed bridge in Vancouver. His numerous written publications and involvement with a large number of major long-span bridges have earned him international acclaim and numerous awards, including both the Gzowski gold Medal and the Pratley Award, and both of these awards twice. 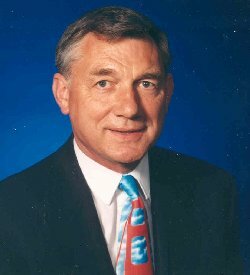 Apart from his individual expertise as a bridge engineer, which results in him being often asked as a guest speaker, the firm that he founded in 1970 brings much credit to Canadian engineering. It has operated as Buckland and Taylor since 1972, where he was President for 30 years. He built the company specializing in bridge consulting, and it is now the largest and best-known firm of its kind in Canada. It has also earned an international reputation with major bridge projects in Canada, the US, and for long span cable-stayed bridges in England, Thailand, China and Greece. Ladies and Gentlemen, I introduce an engineer who has brought acclaim to himself and to Canada. Tonight we honour as Fellow of the Engineering Institute of Canada.